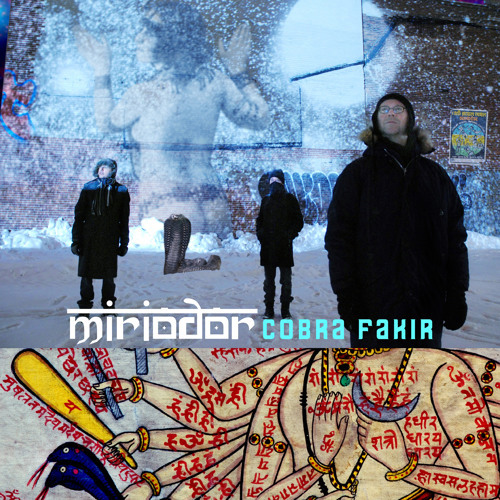 PRE-ORDER/PURCHASE 'Cobra Fakir' by Miriodor @ AMAZON (digital & physical): http://amzn.com/B00E334J8Y ITUNES (digital): https://itunes.apple.com/us/album/cobra-fakir/id687622586 BANDCAMP (hi-fi digital): http://cuneiformrecords.bandcamp.com/album/cobra-fakir Over a nearly 35 year-long career, Miriodor have continuously produced music that is intricate, melodic, challenging and filled with both humour and fire. Cobra Fakir is the group's eighth studio album and, like all their releases, is a captivating new-music gem filled with great musicianship, terrific tunes and a distinctive and personal sound. A cobra fakir is a snake charmer, who uses carefully concocted melodies to put the mighty reptile under a sort of sonic spell. That’s an apt analogy for what will happen to even the hardiest ears upon introduction to Miriodor’s newest eccentric-but-bewitching batch of tunes. Miriodor are one of the core bands of what’s become known as the R.I.O. (Rock in Opposition) style, an international agglomeration of artists whose core tenet has remained a commitment to creating challenging music that freely incorporates everything from progressive rock and jazz to avant-garde experimentation and even elements of various folk traditions. The group's long evolutionary process has led to the trio we hear on Cobra Fakir: founding musicians Pascal Globensky (keyboards, synths, piano) and Rémi Leclerc (drums, percussion, keyboards, turntable) with longtime member Bernard Falaise (guitars, bass, keyboards, banjo, turntable). The multi-layered complexity of the pieces they’ve crafted for Cobra Fakir belies the relatively spontaneous method in which much of the music was made. "Being back to a trio format (once again), about one year before our target date for a release on Cuneiform Records in September 2013, with very little material on hand, we rolled up our sleeves and got immersed in the work. We built on what we had, which was a few sketchy pieces (demos) and we also recorded several improvs, planning to extract stuff from them and then creating new pieces from that. For about 8 months, this has been a very fun and very intense period of exchanging files and challenging each other with either strange and unexpected stuff, super arrangements, a great solo, or simply a very promising new tune. For this record, Rémi has been fiddling a lot with various percussive objects and machines (acoustic or electronic), a strong interest of him lately. This gave the album a wide array of colorful tonalities in the percussive department. Bernard had lots on his hands, from morphing into a bass player, creating his numerous guitar parts, and adding a myriad of arrangements and textures, with keyboards, turntable and editing. All this, plus the job of mixing the album and participating in the mastering of the album made for a pretty busy fellow. Pascal had fun toying with improv extracts, adding textures and atmosphere a bit everywhere on the pieces, throwing a pinch of concrete sounds for good measure, ending up with some uncharacteristic passages for Miriodor. It has been a hectic, very intense and brain-squeezing period for the three of us. We delivered in time, and the baby’s going fine, thank you!" Can't wait for your next album!!! Cool stuff. Looking forward to the album!